SAN SALVADOR/ATIQUIZAYA, El Salvador , Sep 11 2017 (IPS) - A paradigm shift is needed regarding how food is produced, consumed and marketed in Latin America and the Caribbean, in order to curb health problems related to poor nutrition. Finding healthy and sustainable food production systems was the idea debated by experts, academics and representatives of governments of the region and United Nations agencies, at a regional forum held Sept. 5-7 in San Salvador. The challenge is overwhelming: to fight against not just hunger and malnutrition, but also overweight and obesity in Latin America and the Caribbean, which are on the rise in this region of over 640 million people. The three-day Regional Symposium on Sustainable Food Systems for Healthy Eating in San Salvador was organised by the United Nations Food and Agriculture Organisation (FAO) and the Pan American Health Organization (PAHO). “This space is an opportunity to share experiences, because we are working hard to have standards, as a challenge for society as a whole: urbanism, a sedentary lifestyle, changes in eating habits, over-processed fast foods, end up being a threat,” said Carlos Garzón, PAHO representative in El Salvador. In 2012, 38 million people died from non-communicable diseases, 48 percent of them under 70 – “people who shouldn’t have died,” he said. “And a good part of these diseases, such as diabetes and hypertension, are linked to overweight and obesity, and thus, related to diet,” he stressed. For his part, Julio Berdegué, FAO regional representative for Latin America and the Caribbean, said this part of the world is losing the fight against hunger and overweight. He said this region had had an important leadership role at a global level, with comprehensive public policies to tackle hunger, and had managed to lift 26 million people from a state of food insecurity since 1990. “But for the last five years we have not been making the progress we had been making. I regret to have to announce that the data that FAO will publish next week will confirm that, for the first time in a generation, the world, including our region, are experiencing a setback in the fight against hunger,” he said during the forum. And with regard to obesity, he said that in 24 countries in the region, 20 percent or more of the population is overweight. In Chile, Mexico and the Bahamas the proportion is over 30 percent, while in Uruguay, Argentina and Trinidad and Tobago it is nearly 29 percent. According to FAO, obesity is eroding the development opportunities of nearly four million children in Latin America and the Caribbean. In Brazil and Paraguay, 12 percent of children are overweight, in Chile, Bolivia and Mexico the proportion is nine percent, and in El Salvador, six percent. Some of the participants in the forum visited the village of Pepenance, in the municipality of Atiquizaya, 83 kilometers west of San Salvador, to learn about the effort made since 2013 by the local school to promote the Sustainable Schools programme. This project is part of the Sustainable School Feeding Program of El Salvador’s Education Ministry. In the programme, students learn to produce food in the school garden, and eat a nutritional daily meal based on vegetables and other natural products purchased from local family farmers. 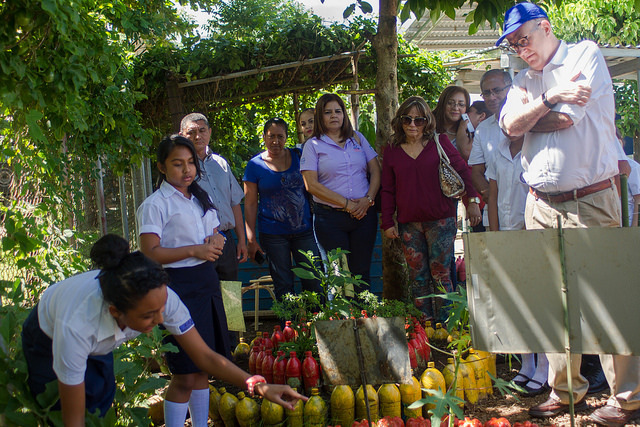 The Sustainable Schools initiative, supported by FAO and financially backed by Brazil, is implemented in 10 of El Salvador’s 14 departments, and covers 40 of the 262 municipalities and 215 of the over 3,000 schools located in rural areas. It benefits a total of 73,000 students. Principals from a dozen other schools in the municipality visited the school in Pepenance, along with local farmers and others involved in the project, to stress that the effort must be sustained and expanded. Ana Fajardo, head teacher at the Parvularia Cordelia Ávalos Vda. de Labor School, explained that some students used to miss class because they were malnourished, before the local schools in this Central American country of 6.4 million people began to serve nutritional meals. But things have changed since the school joined the programme, she said. Now they eat healthy meals at school, based on cereals, grains, fruits, vegetables and sources of protein. Ninth grade student Yajaira Ortiz said the school garden not only helps them learn to grow food, but is also useful in subjects like math. “The gardens make our class more interesting, we get out of the classroom and see that we have many geometric figures there too,” she said. In the gardens, the crops are planted in geometric shapes, like triangles and circles. 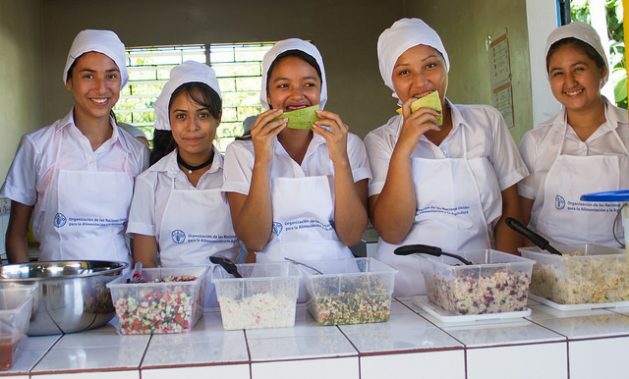 Exploring experiences like El Salvador’s school meals programme and similar initiatives in other countries was part of the debate in the forum held in the Salvadoran capital. El Salvador is among the group of 13 countries from this region that since 2009 have formed part of an initiative sponsored by FAO and the Brazilian government, aimed at expanding the programme of sustainable schools, adapting what Brazil has achieved through its national school feeding programme. The FAO regional coordinator for the Strengthening of School Feeding Programmes in Latin America and the Caribbean project, Brazilian expert Najla Veloso, underscored that it is important to get local farmers involved, because this strengthens the social and economic fabric of the communities. Veloso explained to IPS that in Brazil, 30 percent of the food served daily to 42 million students comes, by law, from local producers. “It is necessary to buy from family farmers, because that produces changes in the local economy and empowers the communities,” she said.